He is one particular artist who truly lives up to his name. He's always been a source of wonder and his most devoted fans over the years have nothing but praise, amazement, and admiration for such an outstanding entertainer. He is none other than Stevie Wonder. 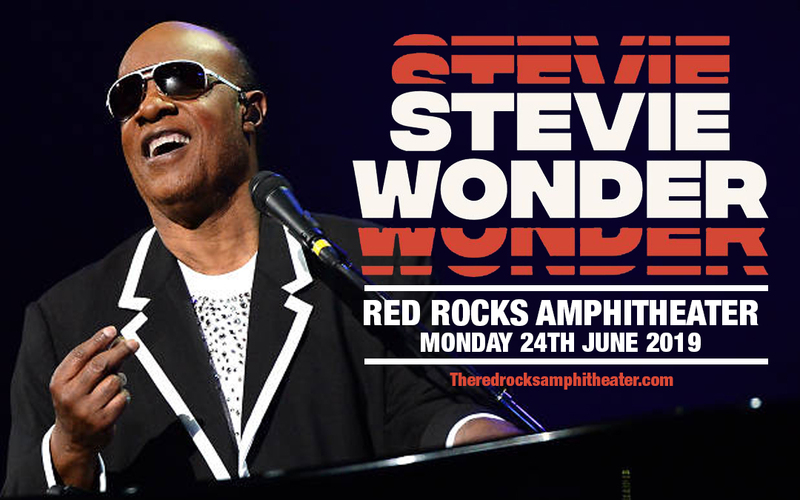 Once again, fans will truly be overjoyed to hear that Stevie Wonder is out on the road for an extensive concert tour, and is headed down here at the Red Rocks Amphitheater on Monday 24th June 2019. Be there as Stevie Wonder flashes his radiant smile and sings his greatest hits with all heart and soul. Indeed, a concert not to be missed. Book your tickets early, save your seat. A night full of music and wonder is guaranteed for all! They say the eyes are the windows to the soul…But in the case of Stevie who is blind since birth, his ultra-radiant smile, his heartwarming aura, and of course his soulful singing voice has become the channels where he pours out his heart and soul. He was signed by Motown at a young age of 11, and at 13, he became a bonafide star, being the youngest artist ever to reach the number one spot on the Billboard charts with his debut single “Fingertips”. "For Once in My Life", "Signed, Sealed, Delivered I'm Yours", “My Cherie Amour", "Yester-Me, Yester-You, Yesterday", “Superstition”, “You Are the Sunshine of My Life”, "Ebony and Ivory" (with Paul McCartney), "Overjoyed", "Lately", "I Just Called To Say I Love You", "Used To Be", “Don’t You Worry ‘Bout A Thing” … this list can't seem to stop, and the man has got no signs of slowing down. If you go by the number, Stevie Wonder has: 30 top ten US hits, 22 Grammy Awards, 23 studio albums that sold cumulatively over 100 million records. How can you miss such wonder of the world?!! This is your chance to witness one of the greatest entertainers of all time. Book your tickets now!